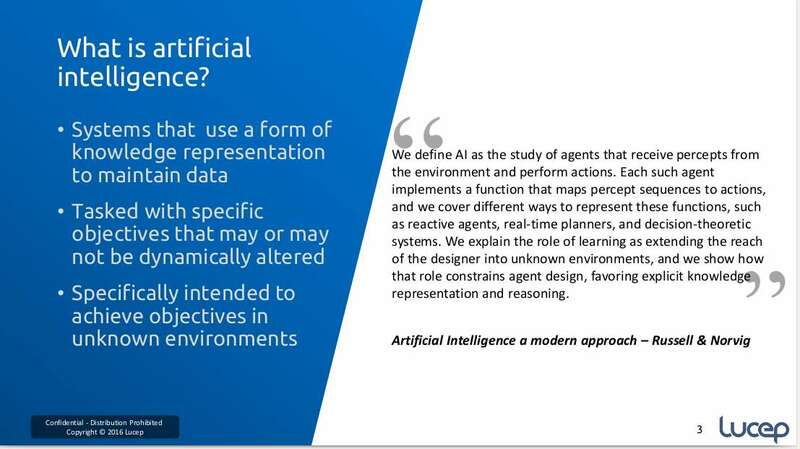 This is an excerpt of a presentation on the impact of artificial intelligence on different industries and jobs, by customer experience management company Lucep Technologies CEO and Cofounder Kaiesh Vohra. Let’s start with a breakdown of what is artificial intelligence, and then we’ll look at how it’s being applied in different verticals. “The basics of AI is very simple. You must be able to encode the world into a form of knowledge representation. Now, what does that mean? It means that the machine has to have a way to represent and store and access knowledge. When it does that, it can then reuse different components of that knowledge as it sees fit. This allows it to make decisions, which is very different to automation. In automation, you have the factory, you have the car, you have all this stuff, which you decide what happens. The key here is he decision – humans decide what happens with automation. Machines decide when it’s artificial intelligence. So it will know when to turn the car, it will know when to turn off the factory, when to turn off the lights. It makes that decision for you. 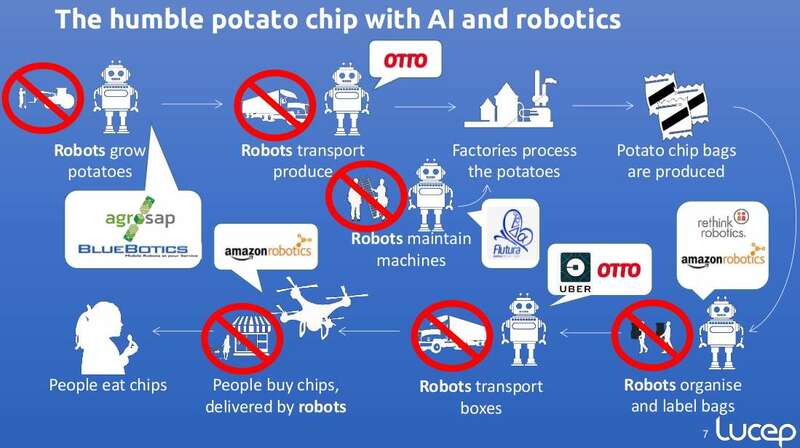 In this next section, he explains how AI impacts us in every way, using a demonstration of the impact of AI on the humble potato chip supply chain. 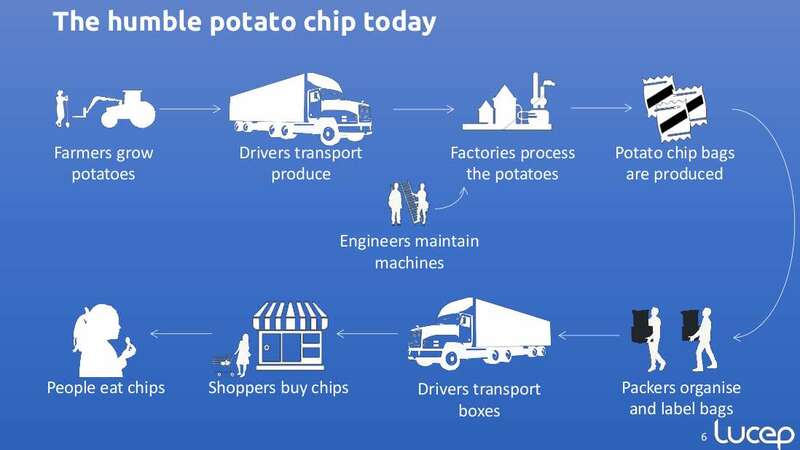 “The supply chain of the potato chip has historically involved a lot of humans along the way. Machines and factories have mechanized, so you’ve got factories processing potatoes. That’s what you know, and that’s what you envision today when I say – potato chip. You think, Oh. Well, potatoes go inside, some machine cuts them, boils, fries them, puts them in a bag. Off you go. Then you’ve got bags, which generally come from China, which are then also used and added to the process, and potatoes filled in. Human packers, human drivers, and then, when you go into the shop, you actually go pick it up and then you eat them. This is your future, all right? So if we think about all that’s left with humans – you eat them. Right? And Maybe you don’t even have to do that part. But this is all true stuff. This is true stuff. Every single one of these companies already exists. It’s not something that we’re imagining. It’s not future tech. It’s here today. “When machines were rolling out, people said – Oh, look! Machine’s going to take all your jobs. Humans will have nothing to do. We can sit on the beaches. It’s the same sort of thing. The same argument is rolled out again and again, saying we’ve seen this before. It’s a little bit different. The job displacement rate is far, far greater this time. And it doesn’t impact just one localized piece. It impacts everything. There’s a great calculator online that tells you how likely you are to be consumed by machines… But the challenge for us – India, specifically, is in about 2 years and 2 months, we will have the world’s youngest working population. Are the skills that we’ve been teaching this generation relevant at all, for what’s coming? Because if it’s not, then the issue, in terms of jobs, in terms of being able to make their skills relevant for anything that is innovative, we’re not prepared for it, and neither are our organizations. The industries that are challenged immediately are telecom… software development, agriculture… transportation… financial services, etc. We don’t know what we don’t know yet, so we can’t see jobs that we haven’t yet understood. You never knew that you needed a car mechanic when they were building a car. So different jobs will be created, but what we know will save us is our ability to concept learn – that is our ability to have that artistic flair in what it is we do, because that allows us to be creative. Our education system here today doesn’t necessarily promote that. So part of what we have to understand is how we are going to be again, skills training… Can’t emphasize it enough. You need to prepare your organizations. If it doesn’t come in 3 years, it comes in 5. If it doesn’t come in 5, it comes in 10. You have to be able to prepare your organization and your stuff for that. See the full video – What is AI? Lucep Technologies CEO and Cofounder Kaiesh Vohra is an expert on artificial intelligence, its application in marketing automation and sales enablement, and in scaling customer management for SMB and enterprise.